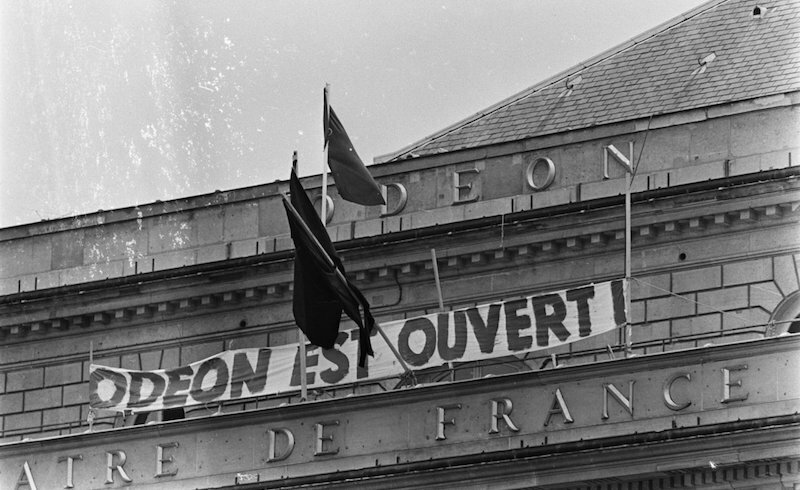 The occupied Odéon, May 1968. via Wikimedia Commons. Excerpted from The Comrade from Milan. Everything was happening very fast: in Vietnam, Czechoslovakia, China — which was coming to the end of the Cultural Revolution, though we didn’t know it at the time. Meanwhile Europeans looked on in astonishment as their own young people said things that had never been heard before and that had an irresistible impact. In early May, the student protests at the University of Nanterre reached boiling point and overflowed to Paris where they became a symbol for the whole world. Then the movement spread beyond the universities. In a few days, France was brought to a standstill by a general strike and power vacillated. Power meant no less than Charles de Gaulle. He, too, took his time to respond; first he disappeared for a few days, leaving a dangerous vacuum — where had he gone and who with? General Massu, the torturer of Algeria? — and then reappeared, alone and his usual arrogant self, to put an end to the disorder. He had understood, or had bet, that the youthful wave of protest would back off from getting involved in the political sphere and any attempt to replace his government with one led by Pierre Mendès-France, who had marched with the students up to the symbolic Place Denfert Rochereau. De Gaulle was the system, Mendès-France a reformer of the system. The students preferred pouvoir to remain indefinitely on the rue, and they didn’t even have time to discuss a possible leader; in any case, they delegated nothing, to no one. But the reins of power can’t be dropped for long. De Gaulle took them up again. The unions negotiated the end of the general strike — they obtained some concessions; what else could they do? But once the agreement was reached many a worker returned to the factories in tears. In the Renault plant in Billancourt, the strike committee closed the factory gates when an enormous crowd of students marched to give "the working class the red flag which flew over the Sorbonne so that they could take it from their fragile hands" — that’s what was written on the banner at the head of the march. They remained outside and nobody from the strike committee would even go out and talk to them; at nightfall they all dispersed. I thought it was awful. In Italy the elections were called for mid-May. The Milan federation phoned me and proposed putting me up for re-election as a deputy, provided that I agreed to show greater discipline. But I knew that an important debate was on the horizon and I didn’t want any privileges — because being a deputy was a privilege, much more at the symbolic level than it is now and much less at the material one. My branch in Milan protested when they didn’t see my name on the list of candidates, but their protest wasn’t really justified — if I had agreed to some sort of discipline they would have willingly elected me. I would have attracted a few votes, and I was a hard worker. In truth, I wasn’t at all keen, for the party was taken up with much more important things; there were high hopes that the events of that year would change the PCI, maybe not completely but enough to shift it to the left — it was a living organism, it wasn’t like the PCF, and what was happening outside would affect the party internally, it would react. The party did well in the 19 May elections — the student protests brought in a lot of votes. Not that the students cared that much about the elections; they were indifferent to politics rather than against them and were simply using their votes to help out their weak parents. The PCI would capitalize on the votes of groups, including those in the seventies that were much more controversial, for a long while. It never thought it owed anything in return. Who on earth was there to the left of the PCI? I voted in a hurry — I don’t know who replaced me in the Chamber — then rushed to Paris to see the revolution. People ought to talk seriously about the May events in France, almost solemnly, in fact, because whether you approve of or whether you detest what happened, it cannot be denied that it was a historic watershed. What had surfaced in Italy over the previous year and sparked off protests from Paris right across the world became a symbol and produced its own symbols, and on the walls of the city slogans blossomed that still echo in our minds as those of no other movement in the century have done — language and intellectual tradition played a very important part in the way different forms of self-expression came together. In the seventies, or the early eighties, the Paris city council had all that wonderful written history erased from those walls. The last quip that I saw, after all the walls had been whitewashed, was a pathetic "Good god, say something!" But this came later. Meanwhile Lucio Magri, Filippo Maone, and I, like many others, went to visit the barricades. Our incursion had its comic moments. The first was in the timing: the elections in Italy had been held on 19 May, so we had completely missed the build-up to the protests. When we set out on our journey in France the transport system was still on strike, trains were idle, planes were grounded, there was no petrol and the filling stations were all closed. Our friend the editor Diego De Donato took the risk of lending us his Giulia, and we packed it with cans of petrol and hoped we wouldn’t have an accident, because we would have gone up in flames. Lucio Magri was a very good driver, but he had returned from his exile spitefully deprived of his driving licence, so whenever we saw the traffic police on the horizon, in a flash Filippo Maone had to take over at the wheel. Maone, on the other hand, had no passport, a confession he only made to us as we were about to enter the Mont Blanc tunnel, just past Entrèves, so that he wouldn’t be left out of the expedition. Two metres from France, which was then at boiling point, I could only stammer some idiocy to the border guard — I’m a deputy (I was already no longer one), I am expected in Paris (I don’t remember by whom), this man (Maone) is my secretary. I don’t think they swallowed my story, but they let us though because chaos is chaos, and on the other side the French border guard had gone missing, on strike. A little later we discovered that the Exxon pumps were open again, making our flammable cargo an unnecessary nuisance: we had to pour it in can by can, and it lasted us until the return journey. We set up camp in Karol’s house and rushed off to the Latin Quarter, which was on edge but far from terrified. Everyone was talking to everyone else. There were still some clashes with the police, but unlike what happened in Italy in the decade that followed, there was no bloodshed — a few paving stones were thrown. No revolt was ever less sinister than 1968, or more decisive or more joyful, as if the protesters felt that everything was within their grasp, or more precisely had already been achieved. We spent the first evening at the Odéon, packed in like sardines, and it was moving to see how everyone stood up to speak, not just as part of a group but singly: people who had never done anything like this before talked about themselves to the world, often finding it difficult. "Let them speak" came the cry in support of those who took their time or stumbled, as they struggled to express their problems and their sense of loneliness. The pain of being alone, and their astonishment at finally being together with others, with everybody. There was no theme to the evening apart from this telling and listening, and whenever a well-known face (after queuing up) took up the microphone she or he was listened to with neither more nor less attention: the object of the demonstration lay in the act of demonstrating, objectives were achieved in the act of putting them forward, for the system, authority, rules and regulations had already all been done away with. We were beyond the reach of any prohibition. Quotations were greeted impatiently. There were no teachers; the crowd of young and not so young people felt no need for them — because everybody was allowed into the Odéon, even passers-by, even the lowliest down-and-outer. Whether France is silent or shouting, asleep or at the barricades — and the movement that evolved in 1996, almost thirty years later, would rediscover this for several weeks — there is the same sense of fraternity, something that I have never encountered in Italy. The PCF also waited for the tide to ebb; a couple of days later, I went to the Bourse du Travail at Billancourt, but they wouldn’t let me into the factory; no student had any hope of talking with the workers, and even less than none with the union leaders. It was something of a concession that the Bourse itself, the camera del lavoro next to the Renault plant, didn’t turn me away, and I was a member of the Central Committee of a fraternal party; they answered a few questions, but were distinctly chilly. A few flames were still flickering: at Flins the struggle lasted much longer and claimed a victim, the workers’ self-management system at Lip lasted for years, but otherwise the events of May ended as quickly as they had started. They left in their wake the extra-parliamentary groups, but those had an even shorter life than ours did. In June, we set off back to Italy. France, having climbed down from the barricades (outside Paris not much had gone on), was showing off its gentle peaceful countryside. We suddenly stopped in our tracks when we saw parachutes landing, but that was just some sort of sports activity. As we gripped the security fence around the airfield Lucio Magri and I didn’t talk; our heads were full of troubling questions, and we turned and went back to the car in silence, so wrapped up in our own thoughts that we didn’t notice that Filippo Maone hadn’t slipped into his usual place on the back seat. It wasn’t until several kilometres later, when we started talking again, that we realized that no one was joining in from the back; we turned round and it was a good half hour before we found him fuming at the side of the road. That evening, with Maone silently raging and the car stinking from the cheeses we had bought for De Donato, we drove back into Milan. The following day we took part in the first joint rally of the Italian student movements, at the University of Venice. I don’t remember who organized it, but it was an attempt to form links that until then had been rejected. The main lecture theatre in the faculty of architecture was bursting at the seams; it looked enormous to me and I was supposed to speak. I was scared. What should I say, what would be the right thing to say, what would that seething cauldron, certainly less fraternal than the assembly in Paris, find acceptable? I had to stop myself from running away from the applause that greeted me. Go on, go on, the comrades encouraged me. I am always scared and I always go on. And always I am apparently well received. That time, too, I was apparently well received. But I realize, months or years later, that I’ve been left empty-handed. I doubt whether I was ever able to take charge of anything, not even an assembly in June 1968.